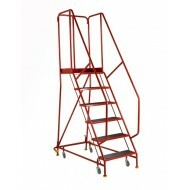 Quality warehouse safety steps at competitive prices with free delivery on most products, Custom made products to suit your requirements Call now or order online. These BS Steps are built with the most demanding environments in mind. 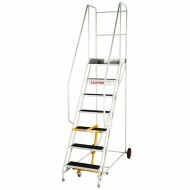 Their robust all welded st..
4 Tread Economy Steps Choice of anti slip treads and punched treads. Average Working Height 2500m..
4 Tread Step Anti-Slip Treads Kite Marked to BS EN 131-7 Steel welded constru..
4 Tread Step Punched Treads Kite Marked to BS EN 131-7 Steel welded construction providing extrem..
4 Tread Step Rubber Treads Kite Marked to BS EN 131-7 Steel welded construction providing extreme..
5 Tread Economy Steps Choice of anti slip treads and punched treads. Average Working Height 2750m..
4 Tread Step Aluminium Treads Kite Marked to BS EN 131-7 Steel welded construction providing extr..
5 Tread Step Punched Treads Kite Marked to BS EN 131-7 Steel welded construction providing extrem..
5 Tread Step Anti-Slip Treads Kite Marked to BS EN 131-7 Steel welded construction providing extr..
5 Tread Step Rubber Treads Kite Marked to BS EN 131-7 Steel welded construction providing extreme..
6 Tread Economy Steps Choice of anti slip treads and punched treads. Average Working Height 3000m..
5 Tread Step Aluminium Treads Kite Marked to BS EN 131-7 Steel welded construction providing extr..